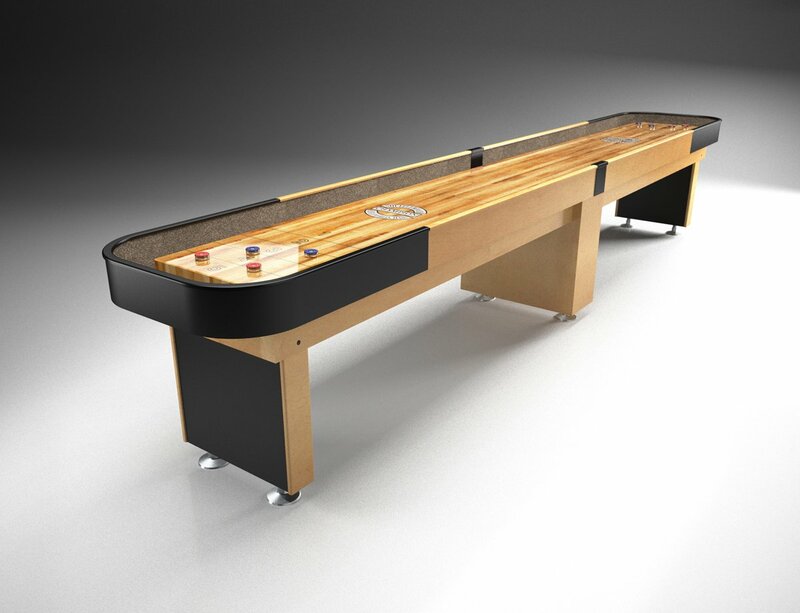 The 12-Foot Champion Championship Line Shuffleboard Table is a table fit for professional-level play. Featuring an attractive solid Canadian maple playfield with a polymer finish that comes standard with a lifetime warranty plus an oak veneer table and legs that comes with a 90-day warranty, this high-quality shuffleboard table is ideal for players who require optimum performance. 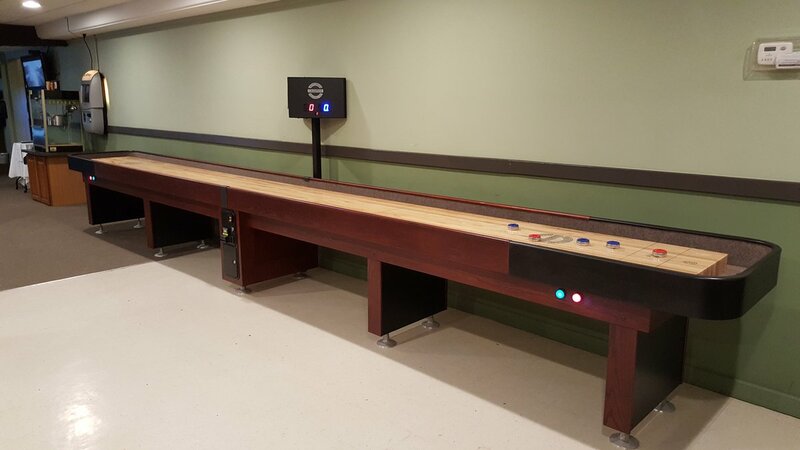 The well-built Championship table can be ordered with a coin-operated add-on, making it perfect for bars, resorts, arcades or any establishment that recognizes the value a coin-operated shuffleboard offers. Additional features, like Champion's patented Handicap Scoring, climatic adjusters and an optional pin gate allow for smart, engaging play in any environment. 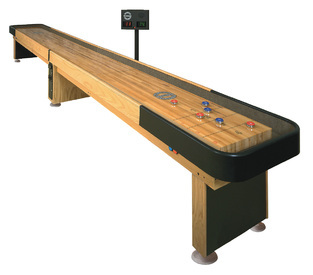 This 12-foot shuffleboard table comes with one set of eight weights (otherwise known as pucks or rocks) and wax. You can customize your shuffleboard table with various options from The Shuffleboard Federation, including 12 stately stain options, a full-color logo, five scoreboard styles, a light kit and more. We offer various fast shipping options, including free curbside delivery or in-home delivery and installation for an extra fee. 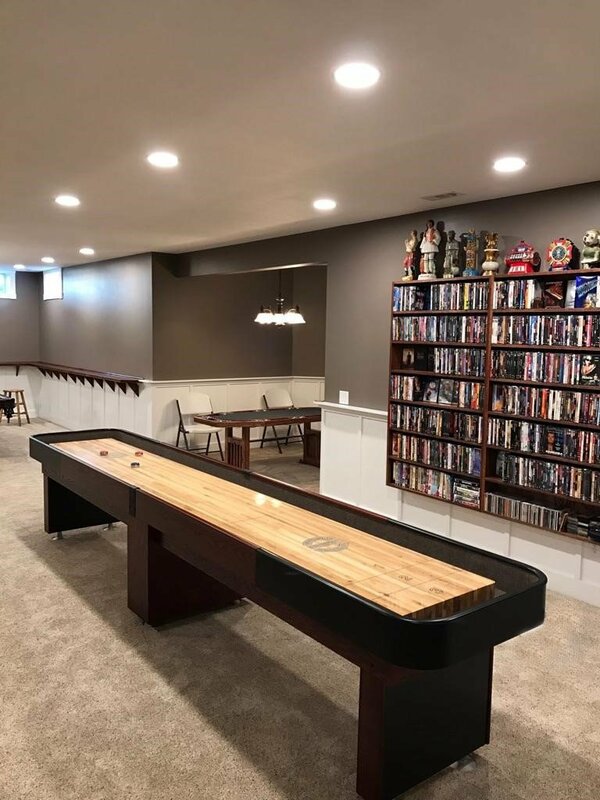 The Champion Championship Line Shuffleboard Table also comes in a 16-foot, 14-foot, 18-foot, 20-foot and 22-foot option from The Shuffleboard Federation. Oak veneer cradle and legs. Playfield: 10' 8" long x 20" wide x 3" thick (7" with the climatic adjusters). Other Available Sizes: 9', 14', 16', 18', 20' and 22'. Cradle Length: 12' overall, comes in two 6' sections. This model has three legs and four climatic adjusters. Scoreboards: Large Round, Triangle, Small Round, J-Bar, and Rail Mount. Pin Gate anti free play device (available for coin operated units).